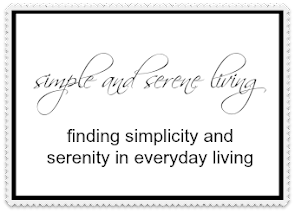 F Simple and Serene Living: HALF FULL OR HALF EMPTY? As many of you know I have a lot going on in my life right now. I have chosen not to share most of it out of respect for the privacy of my family, but thought I would talk about one thing today. We recently found out that my mom has two aortic aneurysms. One is abdominal and one is descending thoracic. My mom has never had high blood pressure or hardening of the arteries, but her mother had an aortic aneurysm so there is a genetic predisposition. It is probably something I will have to talk to my doctor about. My mom's thoracic aneurysm is large and would normally be taken care of with surgery. However, she is 91 years old and although she is in really good health otherwise, major surgery at her age is extremely risky. So yesterday, she and I sat down and talked to a surgeon. We knew we had some decisions to make. I asked the doctor what he would advise if it was his mom. He said he would advise her to just keep on living. To keep doing the things she loves. He said my mom probably had several good years left and that although he would do the surgery if she wanted he believed that it would be very risky. He advised her to stop getting scans, which would just worry her and to try and put it out of her mind. So, after asking questions and discussing it, that is what we decided to do. No matter how old we are, or how old our parents are, we don't want to lose them. We want to do something to help them, but sometimes all we can do is be supportive and offer love. None of us get out of this life alive, and as my mom said she has had a very long life. I hope the doctor is right and she has a few good years left. We are choosing to see the glass as half full. You can find more information on aortic aneurysms here. Laura, I completely understand. My Mom is only 85 but has heart issues. While she is sharp and capable she has also said no big surgeries she won't live through them so she cherishes every day to the fullest. It's enough for me that she is happy! Hugs to you and your Mom. I am so glad that your mom is near to you now, Linda. SO important for both of you. Hugs. Laura, that is exactly what I would do too. Why take the risk. She's enjoying life as full as possible right now and that is wonderful and such a blessing! And there's no point in seeing the glass half empty any time in life. There's nothing about that which helps us. Being positive has so many good rewards. Blessings! You're right, Judy. Being positive does have so many rewards. My mother is 89 and I can totally relate to this post! Driving and playing bridge! Living life to the fullest! That's the way I want to do it when I grow up! What a wonderful way to go. That is exactly how my mom wants to go, Lorraine, and that is my hope for her. I tell her that I love her every day and I know that when the time comes it will be right. Thank you. I know that it is never easy for any of us to lose our moms. You wrote that story so beautifully and I love the picture that goes along with it. Life can be so complicated but then so simple too. I think you are making a good choice. Love to you and your family - especially your mom. Thanks for sharing. I love your positivity and how blessed your mother is to be 91 'years young'! Her doctor sounds very astute. My mother had a heart condition and when she was diagnosed with lung cancer at 72, the radiation affected her heart and it was decided it was more detrimental than good. We had to resign ourselves to the cancer taking its course and it did. We lost her a few months later. These decisions are hard, and like your mom, mine was sharper than a tack and accepted the inevitable. It hurts to write about it. It's cliche, but embrace every day. I am so sorry that you lost your mom at such an early age, Jane. Thank you for your sweet words. How wonderful your mom is living life to the fullest at 91 years old. I think you all made a great decision. Life is precious and each day a gift so live it to the fullest. My mom just went through her second bout with breast cancer at 84 and opted to not have the chemo. The chemo would do more harm than good so she just felt since they got all the cancer to continue to live on and not do the chemo. The doctors told her the cancer could come back right away or it could stay at bay for many more years with doing nothing. So she is going to hope her decision was good and live each day to the fullest in good health. These decisions are hard ones to make but you have to do what is right for your situation. Glad you are such a great daughter to be there by your mom's side through this decision process. Kris, I wish all the best for your mom and I will pray that her cancer doesn't return. I am glad that both of our moms are living life to the fullest. Your mom is definitely a glass half-full person! I love her attitude and energy. Enjoy every moment with her. My mom has been gone thirty-five years and I still miss her everyday. Oh Donna, I don't think we ever get over the loss of our parents. I feel so lucky that mine is still here. We talk on the phone several times a day. I know how much I will miss that when she is gone. So many sad stories in the comments Laura...and nestled among them are stories of courage, and hope. Your Mom is an amazing woman, and I'm glad that she made a decision that works for her. Quality of life is just as important as longevity. You are so right, Jen. My father suffered for so many years and I know that the last few were unbearable for him. I'm happy that my mom has made the decision that she did. Thank you so much, Pam. It was difficult, but I believe it was the right decision. She is having fun watching football this afternoon. my mother almost reached a 100. She said no tests, no treatment, and led a good life until the last few weeks when she faded. My father went to thru an operation, which I wish he could have been advised out of. It is good to have a doctor who is honest and caring. You and your mother have a good and close bond. I hope my mom will live that long too, Diana. We always thought she would live to be 100,but however much longer she lives I just hope they will be good ones. My mom and I have always been a rocky relationship. I am glad it has gotten much better towards the end of her life. I think your mom has a very good doctor. He obviously is looking at the quality of your moms life and not just the quantity. Extra tests and surgery could lower her quality of life because of the mental and physical strain on her body. 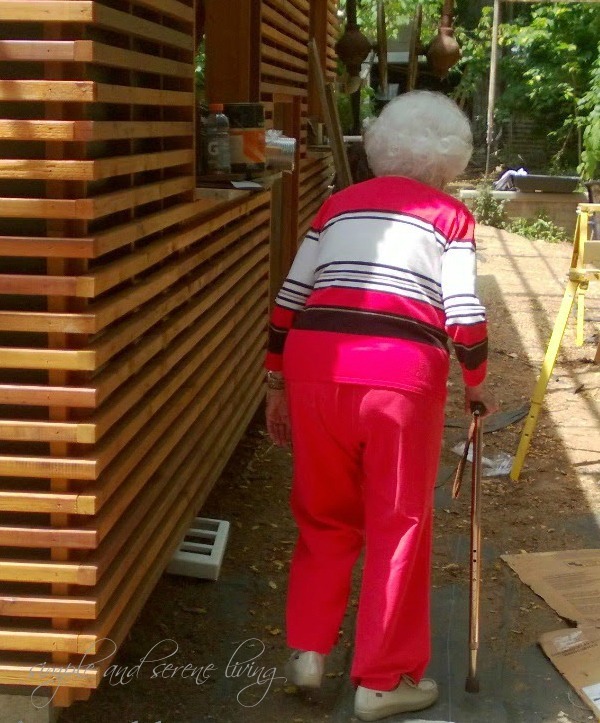 To be 91 and still independent is wonderful! Not many people reach that age and still have a good quality of life. She is very fortunate to be in as good of health as she is Kelly. I hope the remaining years are good ones . Saying a prayer for you and your mother. This is an inspiring post. So much love and support here, I know this warms your heart. Our Mothers are very dear to us, aren't they. I do know that your Mother is blessed to have you. I know the comfort and joy she feels to be with you and have your love and care. You are a good daughter, Laura and your decision is so wise. God is with you both.